The European Commission has fined Google a record-breaking €2.42 billion (~$2.73BN) for antitrust violations pertaining to its Google’s Shopping search comparison service — in what is widely considered the most significant antitrust ruling in Europe since the 2004 Microsoft decision. For some context on the size of the fine, Google’s (Alphabet’s) full year revenue for 2016 was almost $90BN. The Commission said the fine has been calculated on the basis of the value of Google’s revenue from its comparison shopping service in the 13 EEA (European Economic Area) countries concerned. As a result, the EC said it found Google’s comparison shopping service is much more visible to consumers in Google’s search results, while rival comparison shopping services are much less visible. “This decision requires Google to change the way it operates, and to face the consequences of its actions,” she added. Google must end the censured conduct within 90 days — or face additional penalty payments of up to 5 per cent of the average daily worldwide turnover of Alphabet, its parent company, for each day of non-compliance. (Although any such fine for non-compliance would require a separate Commission decision — but would be backdated to the date of when the non-compliance started). Vestager confirmed it will be up to Google to come up with a remedy to comply with the Commission’s decision — although it will also face (likely years of) being closely monitored by regulators for compliance. “The decision requires Google to stop its illegal conduct within 90 days. And Google must respect a simple principle — it has to give equal treatment to rival comparison shopping services and to its own. It has to apply the same method and processes to position and display its own and rival comparison shopping services in its search results,” she added. “When you shop online, you want to find the products you’re looking for quickly and easily. And advertisers want to promote those same products. That’s why Google shows shopping ads, connecting our users with thousands of advertisers, large and small, in ways that are useful for both,” he added. The company said it will “review the Commission’s decision in detail as we consider an appeal”. Vestager further noted that “anyone who has suffered damage from Google’s illegal behavior can claim compensation from Google before national courts”. Another key additional point of today’s decision is that the Commission has found Google to be a dominant company in Internet search — a finding which will now feed into any additional EU antitrust investigations into its behavior. Not just other existing formal investigations, such as pertaining to Google’s search advertising; during the press conference Vestager noted that her department is also aware of complaints pertaining to other Google products, such as image search, maps and travel search. Although she stressed there are no formal investigations into those products at this point. Her department would, however, be looking closely at the particular “characteristics, detail and difference” — as well as “the facts” — in each additional market where concerns are held about a Google product, she added. 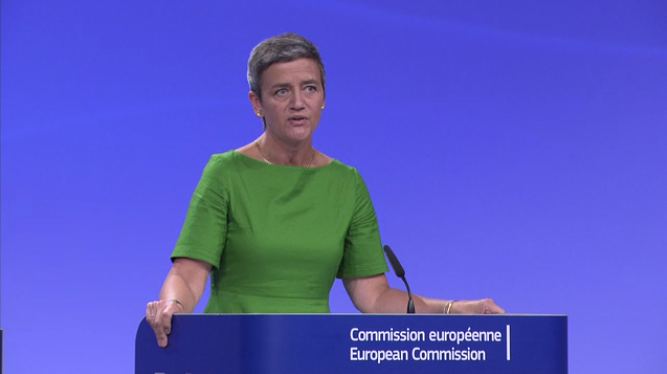 “Today’s decision shows that in Europe companies must compete on their merits,” said Vestager. “Regardless of whether they operate online or on high streets, regardless of whether they’re European or not. We invite you to make the most out of the European market, and the potential of 500 million citizens — and therefore 500 million potential customers. And we congratulate you for being successful. Dominant companies, as Google has now been formally judged, “need to be more vigilant” and have a “special responsibility” to ensure they are not in breach of antitrust rules, she added, stressing this applied both “in the market where it’s dominant” and “in any other market”. Welcoming the Commission’s decision, Shivaun Raff, CEO and co-founder of Foundem, the lead complainant in the case, said: “We welcome today’s announcement that the European Commission has adopted a Prohibition Decision in the Google Search case. Although the record-breaking €2.42BN fine is likely to dominate the headlines, the prohibition of Google’s immensely harmful search manipulation practices is far more important. There can’t have been many Competition cases where the stakes for consumers, businesses, and innovation were any higher. The Commission still has two outstanding formal investigations into Google’s business — into its search advertising practices, and how it bundles other Google products with its Android mobile OS (which in some European markets has around an 80 per cent marketshare). On these ongoing investigations, Vestager had chilling words for Google — suggesting it is also inclining towards a conclusion of anticompetitive behavior. Although she emphasized no final decision has been made. The Europe Union’s investigation into complaints about the Google Shopping service (previously called ‘Froogle’ and then ‘Google Product Search’) dates back more than six years, although the Commission only issued a formal Statement of Objections (SO) in April 2015, extending that in July last year with further objections — when it also issued objections against AdSense. A third EC antitrust investigation pertains to Google’s mobile OS, Android, and also remains ongoing. The bloc’s law puts a special obligation on dominant companies not to abuse their power to try to harm existing competitors or block new entrants. And, in Google’s case, its search engine is massively dominant in the region — accounting for more than 90 per cent of the search market in Europe. The complainants in the Google Shopping case have accused the company of demoting rival vertical search services in its general search results, and thereby depriving their businesses of scale and market access. It has also been accused of positioning its own shopping service prominently in search results. The original complaint to the EC that Google had manipulated search results was made to the Commission by shopping comparison site, Foundem, in 2009 — who said its service effectively vanished from Google search results weeks after launch in 2006, and was not reindexed until years later — to the evident detriment of the business. A formal investigation into this complaint was opened by the EU in 2012, under the prior competition commissioner, who went on to reject three proposed settlements from Google. Current competition commissioner Vestager took up the post in 2014 — by which time complainants relating to the case numbered more than two dozen. She went on to issue formal charges against Google Shopping in 2015, and supplemental charges in 2016. Evidently the Commission disagreed with Google’s defense of its behavior. Vestager touched on some of the company’s arguments in a Q&A during the press conference — saying it had analyzed and dismissed the notion that general Internet search is in competition with search within the “Amazon universe”, for example, as Google has tried to argue. “Exactly this line of thinking and these argument was looked into in depth before we sent the supplementary statement of objection. And there we say we do not find that Google Shopping is in competition with Amazon and eBay and the like,” she said. “And the reason is because they are different. In Amazon and eBay you can search within the Amazon and eBay universe of different retailers. “The competition that should be fierce should be the competition between shopping comparison services — and this is exactly the point of this case, that Google has used its dominant position in general Internet search to promote itself and demote its rivals of shopping comparison services in this particular market,” she added. In a blog post responding to the Commission’s ruling at greater length today, Google continues to dispute the Commission’s analysis — with Walker arguing that consumers shopping online want to find products “quickly and easily”, and that’s why it links directly to products rather than to shopping comparison services. “We think our current shopping results are useful and are a much-improved version of the text-only ads we showed a decade ago. Showing ads that include pictures, ratings, and prices benefits us, our advertisers, and most of all, our users. And we show them only when your feedback tells us they are relevant. Thousands of European merchants use these ads to compete with larger companies like Amazon and eBay,” he adds. During today’s press conference Vestager spent some time detailing her approach to the case, which she inherited from prior commissioner, Joaquín Almunia, after his attempts at reaching settlement solutions with Google had failed. “I chose to take the case forward in a different way,” she said. “Before reaching today’s conclusion we have analyzed huge quantities of data. This includes 5.2TB of actual search results from Google — that is more or less the equivalent of 1.7BN search queries. She noted, for example, that the Commission looked at the impact of having a prominent place in Google’s search results — first analyzing studies on user click behavior, which she said “indicated there is a link” (i.e. between a prominent placement and more traffic). But also running further tests to determine whether users are clicking on the top result because it’s more relevant, rather than because it’s most prominent. “We simulated what happens when you swap the ranking of generic results — and this confirmed that the same result receives significantly more traffic when ranked higher up,” she noted. And while she said the EC had not found specific evidence of intent by Google “when it comes to demoting rivals”, it has evidently found enough evidence of the impact of systematic demotions of rival services by Google’s algorithms, and the contrary promotion of its own services, to conclude that Google’s behavior breaches EU antitrust law. “There are high barriers to entry in the market. The more consumers use a search engine, the more attractive it becomes to advertisers. The profit generated in term can be used to attract even more consumers, similarly the more data a search engine gathers from consumers, well, the better equipped it is to improve its results,” she added. She said Google has implemented its “illegal practices” pertaining to price comparison services everywhere it offers its own comparison shopping service — starting as early as 2008, in Germany and the UK, followed by France, Italy, the Netherlands, Spain, the Czech Republic and finally Austria, Belgium, Denmark, Norway, Poland and Sweden; an area which she said has some 418 million citizens. “Google’s practices have deprived millions of European consumers of the full benefits of competition, genuine choice and innovation,” she added. The Commission’s full decision will be published online in due course, according to Vestager, after it has agreed with Google and third parties involved in the case on any confidential “business secrets” that need to be redacted.